When you right-click a file in Windows Explorer you get a context menu with all kind of options. Included in the list is the Restore Previous Versions entry. A click on the entry opens a dialog that is first displaying a "searching for previous versions" notification before returning all saved previous versions of the file or the dreaded "there are no previous versions available" message if no previous versions have been located. I was asked recently how the previous file versions where created by Windows, and if there was a way to change the amount of file versions to go back. The restore previous versions feature is directly linked to the Windows System Restore and Data Backup features. If both features are turned off, it is not possible to restore previous versions of files in Windows. 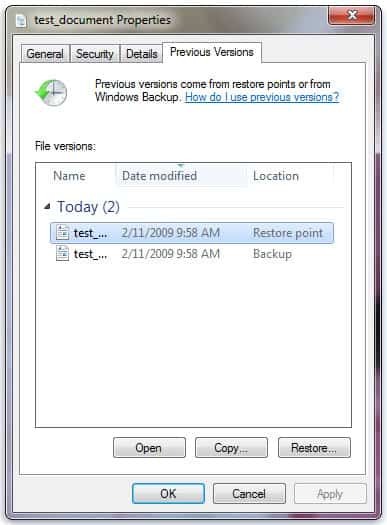 The creation of system restore points or system backups is therefor not only mandatory for the feature itself, but also for the amount of different file versions available. The less space you assign to the features, the less file versions you will be able to restore at a later point in time. Users who only create no more than one or two System Restore points will see fewer file versions in the listing than users who have given the System Restore feature more space on their hard drives. The same is true for users who regularly backup data on their computer. File versions are only saved in restore points when the System Restore feature creates one. This means that users won't see different versions of a file that they have edited and saved multiple times on a day. That is, unless they create System Restore points manually to pick up the changes every time. They still have to keep an eye on the size of all System Restore points to make sure that previous file versions do not get deleted when an old System Restore point is deleted. The feature falls short, especially when it comes to storing all previous file versions of a file for backup and restoration purposes. Users who want to make sure they can restore all file revisions need to look elsewhere for that functionality. There are better options to make sure you have a backup of different file revisions in the Windows operating system. Among them previously reviewed programs like File Hamster or an online file syncing service like Dropbox. simply doesnt work. I dont know if this was updated and start working, but i think its not supported. now i’m home and i see the name of the one i’m using: LockHunter, is very good too. I have it integrated in my Windows Explorer menu. Have not used it for a while but it worked fine previously.